Thursday's Cubs-Pirates game ended in a tie for the first time in MLB since 2005, when the Astros and Reds finished their game even at 2-2. Rules discussion: Is a tie ever an acceptable outcome in Major League Baseball? PNC Park's final game of 2016 ended in a tie. 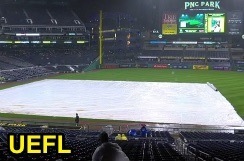 Thursday's game in Pittsburgh ended as a tie in the 6th inning due to persistently poor weather at PNC Park. HP Umpire and Crew Chief Brian Gorman had called for the tarp just one hour and fifteen minutes into the game, but after waiting out another hour decided to formally suspend the game in the top of the 6th inning with a 1-1 score when the weather forecast began to look exceedingly bleak. Whereas Official Baseball Rule 4.04 concerns Weather and Field Conditions prior to the game's first pitch (and states that the home club shall determine whether such a game is to be played [unless the game is the second game of a double header, in which case the umpire shall decide]), OBR 7.02 addresses already-begun games terminated prematurely, with 7.02(a)(5) and (6) used most frequently when a rain delay occurs: "A game shall become a suspended game that must be completed at a future date if the game is terminated for any of the following reasons...(5) Weather, if a regulation game is called while an inning is in progress and before the inning is completed, and the visiting team has scored one or more runs to take the lead, and the home team has not retaken the lead; or (6) It is a regulation game that is called with the score tied." Thus, Rule 7.02(a)(6) states Thursday's Cubs-Pirates game was suspended at the time Gorman opted to terminate the game due to weather...So how could a suspended game "that must be completed at a future date" result in a tie and a called game? A rain delay turned into a called game at PNC. 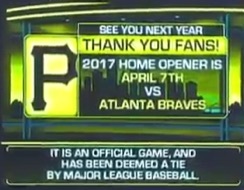 Rule 7.02(b)(4)(B) states how a suspended game that has progressed far enough to become a regulation game AND is the last scheduled game between the two clubs during that season (Thursday's was the final game between Chicago and Pittsburgh in 2016) shall be treated: "If the score is tied, the game shall be declared a 'tie game'" BUT that the game "must be played [to completion]...if the League President determines that not playing such game might affect post-season play, including eligibility for the post-season and/or home-field advantage for any post-season game." Because the Cubs had already clinched home field advantage by virtue of clinching the best record in the National League, and because the Pirates had already been eliminated from playoff contention, Thursday's Cubs-Pirates game qualified as a meaningless game, as far as post-season implications are concerned: A Chicago win or loss would not change anything about the playoffs, and, thus, Thursday's game, as the last scheduled game between the two clubs, was properly declared a tie. Wrap: Chicago Cubs vs. Pittsburgh Pirates, 9/29/16 | Video of Tie Game available via "Read More"